SiteSpinner Helps You Write "Some Website"
There's a lot of pressure these days for every business, big or small, to maintain a blog. However, if you don't have the staff capacity, inclination, or writing savvy to maintain one--or really have nothing to say on a regular basis--a static website is still the next best thing. And for $50, Xara Web Designer is one of the easiest and cheapest ways to create your professional site. Intuitively and quickly create professional---but entirely static--Web pages with Xara Web Designer. Xara Web Designer MX 8 has fortunately kept the simple and intuitive UI from the Xara 7 products (Designer Pro, Photo & Graphic Designer, Web Designer). The fly-out menu on the right side contains all of the templates and clip art bundled with the program. Simply drag and drop the item you want, whether it's a complete website template, individual page, button, header, navbar, or what have you. Oddly, Xara Web Designer's templates all seem to measure about 770 pixels wide--just wider than a SVGA screen, and allowing for a very large border on a XVGA screen. Even though Xara Web Designer MX 8 has a function to extend the bottom of the page, the pages are static; and Xara Web Designer is truly WYSIWYG: Everything you place on the page will show up exactly as you place it, regardless of the browser size of the reader. Also, much of your Xara-designed site won't work if your end user is using NoScript or has scripting disabled in the browser. If this seems problematic, try SiteSpinner (also $50) or WYSIWYG Web Builder ($45) both slightly harder to use, but more technically-focused website design tools. If you have design experience, you won't need to use Xara Web Designer's templates. Instead, you can create an SVGA (760 pixels wide), VGA (640 pixels wide), or XVGA (955 pixels wide) Web page from scratch. Xara's built-in tools for image editing, quick shapes, drawing, and fonts make it easy, and this is one area Xara Web Designer really excels. 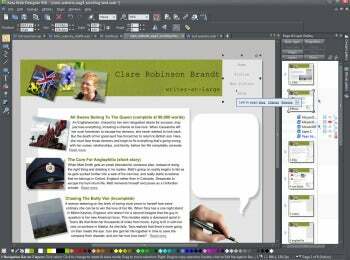 One-click link editing is also a great new feature in Xara Web Designer MX 8. Simply click once on your navbar or link and a popup box allows you to create, change, or remove the hyperlink address. I wish Xara Web Designer had an easier process to create Web-usable graphics from the less-than-Web-friendly fonts (i.e. anything from a typical fonts collection) that are available (a "convert to JPEG" or similar button, much like Illustrator has a "convert to curves" feature for fonts, would be a fabulous addition). I also miss the functionality of seeing the individual objects within each layer, a feature that's not available in Xara Web Designer, but is a great addition in $300 Xara Designer Pro. As with all the other Xara products I've used (Designer Pro, Photo & Graphic Designer, Web Designer 7) there are some features that, after a short time, are very hard to live without. A few favorites are multiple windows that allow you to switch effortlessly between files, and that automatically reopen so when you close the program without saving, your work is not lost; autosave of original images and master files; seamless image editing; and drag-and-drop color changes. There are also a few that seem unnecessarily difficult to master: Creating popups or rollover images in Xara is a huge headache. If you become a Xara addict (and you may, even after just a thirty-day free trial), the addition of the media exchange (or MX) in Xara Web Designer MX 8 will appeal. If you own any other MX-enabled Xara or MAGIX product, you can easily access JPEGs through the share menu. Let's face it, if you don't have any kind of web-presence, you're way behind the curve. If you have the time to come up with some copy and a few images, Xara Web Designer is a super-easy way to create a professional static web page or site. However, if you're looking to create a blog, need an online store, or want to regularly change content, this is not the software for you. Note: The default trial period for this software is seven days. You can increase the trial to thirty days by registering the software. Intuitively and quickly create professional--but entirely static--Web pages with Xara Web Designer.